Over the past few weeks, it's been pointed out to me that I've changed...the girl who used to be so open has hidden herself away, she's more careful with what she says and she doesn't really talk to anyone anymore. Sure, she posts on social media, but it's shallow. It's not what's inside her. It's just enough so that people will leave her alone. Those people are right. Losing Reece changed me. It woke up every feeling of insecurity and worthlessness that I've ever felt. It took me to a place that I never thought I would see again. A few weeks ago, I planned on killing myself. While I'm glad that I didn't, living with these feelings has been incredibly hard. I've shut myself off to most people. People scare me. There. I said it. People scare me. There are very few people that I trust right now and it's to those people that I turn. They're doing their best to remind me how amazing and awesome I am and while I don't argue with them, it's hard for me to believe them. What happened to the girl who was starting to believe that she could do anything? 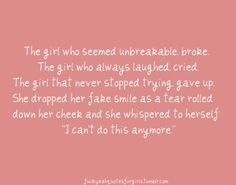 It's as if she got knocked down and then trampled on until there was nothing of her left but a battered and bruised shell. The thing about bruises is that they heal. Some take longer than others, but broken bones, broken hearts, and bruises all heal. It's a process and for someone who constantly has a voice in their head that tears them apart, it can be a long process. Yes, I've hidden myself away but I needed to. I needed to focus on myself and deciding if I were worth the effort. I'm not ready to come out yet. I need this time with me so I can try to be okay again. I have doubts that I'll ever find happy again, but right now, okay seems like a pretty good place to be. Yes, people scare me, but I know that over time I'll slowly start to stick my head out again. I'll find my place and maybe even love again, but right now, I'm going to be quiet. I'm going to protect my heart because it's fragile. The wrong thing said by someone I care about starts the tears flowing. Letting even a few in has been incredibly hard when all I want to do is hide. We're all built with the instinctual fight or flight response. Mine has always been flight. By letting even one person in, I'm trying to fight. I'm trying to silence the awful feelings of worthlessness, of being forgettable, of being a nobody unworthy of anything good.